During the trip, we kept asking Austen, "Where's Adler?" Austen would look down at the floor and then around for her, but he couldn't seem to find her. Suprisingly, he didn't get frustrated with our little game. He just seemed to accept that she wasn't there - probably because we weren't in our own house. Or who knows, maybe he was secretly glad that he didn't have to run to hold onto furniture or someone because he heard Adler barreling down the hallway. You see, he's learned that often times Adler can't put on the brakes quick enough on our slippery wood floors. (In fact, a few weeks ago she braked too late and smacked hard, face-first into our railing. She didn't whimper but she was a little stunned). Here's a sneak peek at their little reunion, moments after we came back from being gone for a week. Now, you can only see the back of Adler but note Adler's paw up in the air and the pure joy on Austen's face. We all know that Adler doesn't like the pool and aside from falling in when she was just 1 1/2, she has never been brave enough to take the plunge. Well, Austen, now nearing 1 1/2 himself, jumped from the side of our pool in Florida last week. Okay so it was an assisted jump but check out how he picks up his foot to jump into the water. And, don't miss the sheer glee on his face as he plunges into the water and then kicks around the pool. Of course this was all after we made my dad call the house rental company to turn up the heat in the pool. I guess even 80 degree Florida weather doesn't heat a pool enough to Austen's liking. Yesterday, we went to the beach. Despite Austen's general fussiness,(we think he's getting more teeth) he enjoyed playing in the sand with his sand toys. But, he wasn't so interested in the water. Too cold for him and he doesn't like when the surf comes up and gets his toes wet although he does enjoy looking at the waves crashing on the beach - but only from afar. Well, about halfway through our beach day yesterday, Austen fell on one of his sand toys and scratched his upper and lower eyelid. People say this is what happens when you have a kid who has just started to walk - they get injured. And, Austen isn't too sure of walking on the sand - yet. 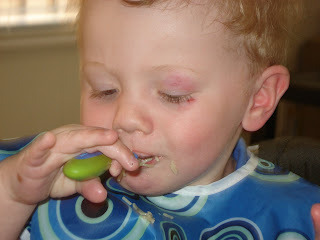 So now our little guy has a nice scratch near his eye to complement his cut on the side of his face. I'm sure he will look just great for my brother's wedding pictures on Saturday. So less than five hours after we arrived in Florida, I was thinking we may be headed to the nearest emergency room. My dad and Tom had just gotten back from the grocery store and were putting the food and drink in the refrigerator. Well, Austen loves the refrigerator so he was playing in the freezer with the ice while Tom loaded the refrigerator side. After piling about eight beers onto a side shelf in the refrigerator, it collapsed causing the beer to crash down on the tile floor. Four of them shattered with glass and beer everywhere. Austen was startled by the crash but as I saw the scene unfolding, I was more concerned with his bare feet standing admist broken glass and spilled beer. I couldn't get the words out of my mouth fast enough instructing my dad or Tom, who were closer to Austen, to pick him up (before he started walking all over the glass strewn floor). Tom did and I quickly surveyed Austen's feet. No cuts, just smelled like beer. I went to the bedroom to put on his shoes and noticed blood on the side of his face. It was then that I realized that a piece of glass must have flown up and hit him in the face. Trying not to panic, I wiped away the blood to see how deep the cut was. It didn't look deep but there was a good gouge there. It took awhile for the bleeding to stop but it finally did. Today it's just a scab that I hope doesn't scar. I guess as a boy, this is just one of many injuries he will have throughout his lifetime. 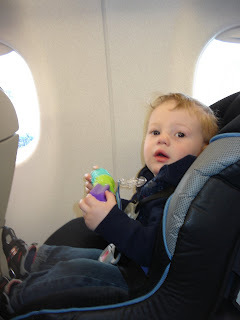 Austen took his first airplane ride on Sunday to Florida. We bought him his own seat which people had recommended we do. Let me tell you I think that was the best decision we ever made in regard to the flight. I can't imagine our 15-month-old sitting in our laps for 2 1/2 hours! Anyway, we had an early morning flight so for the first time, we were the ones waking Austen up! He did great though and was wonderful in the cab to the airport sitting in his little carseat. At the airport, he walked through security on his own and then even had some time to run around and play before the flight. We figured this was good to do before we strapped him into a seat for the next few hours. It was smart. Austen got into his seat on the plane and fell asleep before the plane even took off. He slept for about and hour and a half so we only had to entertain him for the remaining hour. Again, on the advice of some friends, I bought some new toys for him, packed a portable DVD player and had lots of different kinds of snacks and drinks. It worked like a charm. He was great and the trip was a pleasant one. I'm just hoping all goes just as smoothly on the way back. Stay tuned for the next post when I write about Austen's injury that occurred the evening we arrived. Last weekend it finally resembled spring here in Chicago. So we got out of the house and went to the zoo for an hour or so. You can do that when you live close to the zoo and its free! Lincoln Park Zoo is one of only two zoos in the US that are free. At any rate, off we went. Austen's been to the zoo before but I thought this time he just might take more of an interest in the animals. We saw polar bears, camels, lions and flamingos but what Austen was really interested in was the sewer covers and the sticks that he picked up off the ground. Maybe next time, I'll get a picture of him with an animal. I must have kissed Austen a million times since Saturday, touching his sweet little face and silently thanking God that he is here with me. On Saturday, I received a text message while out shopping that Ethan Powell had passed on. Ethan Powell, if you remember from my June 2007 blog post, was the little boy who was only a month older than Austen that was diagnosed with Leukemia at his 2 month old check up. I've followed religiously his parents' daily updates on their blog for Ethan for almost a year now (I hooked my sister in law on the site as well - that's who texted me). I bought a blue bracelet that I wore for almost a year symbolizing that I believed Ethan would get better. Donated money to St. Judes. And, I prayed more than I have ever prayed consistently in my life for this little guy because I was so touched by him and his story and his parents' strength. But, on Saturday, he lost his battle with Leukemia at 16 months old. I'm confident that in his short life, Ethan touched more lives than just my own (judging from the following on his Web site). So to Ethan, who is a great big star somewhere tonight, I say, thank you for touching my soul, reminding me to be grateful for the things that I have and for restoring my faith. From the moment I saw my little munchkin, I knew that he was going to look nothing like me. That became even more apparent as he got older. 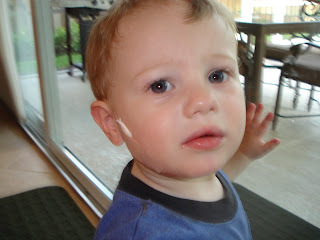 The dark hair that he was born with soon fell out and became a light brown/dark blond - just like his dad's. His eyes are his dad's blue instead of my green. His tiny fingers and fingernails are just like his dad's. And, when he sleeps, his head gets all sweaty and his hair transforms into a million tiny curls - just like his dad's did when he was a little boy. I never really minded that he looked like his dad and not like me (after all, I did marry him). But, I was secretly hoping that he'd have some of my personality traits. Now it's probably still too early to tell but it seems as though once again his dad's genes may have won on that one too. Check out my little guy concentrating on building with his Legos (well, not real Legos but the ones for toddlers). He loves building with his Legos, his blocks and looking up at the buildings from his stroller when we go on walks. From the looks of it, we may have a future architect, construction manager or engineer in our family.